Robotics - Unity Tool Inc.
Robots and Automation have been used in Unity’s facility since 2005, giving us the flexibility to have machines running any time of day, accomplishing automated tasks of all kinds. Unity uses three operating robots for everything from loading parts and pallets to our new system that feeds EDMs both vertically and horizontally. 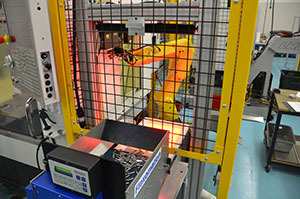 We have even programmed one to use the robotic vision system to save a step that would have slowed down production. Using the robot camera, a feeding mechanism, a shaker table, and a hopper/conveyor, the process was able to continue after-hours, and at a rate quick enough to deliver thousands of parts. See our Case Study for more on our innovative solution. Whether for low volume short-run jobs or high volume projects — whether using robots or not –, Unity welcomes the challenge of finding the most efficient and cost-effective ways to bring every project to a successful outcome.